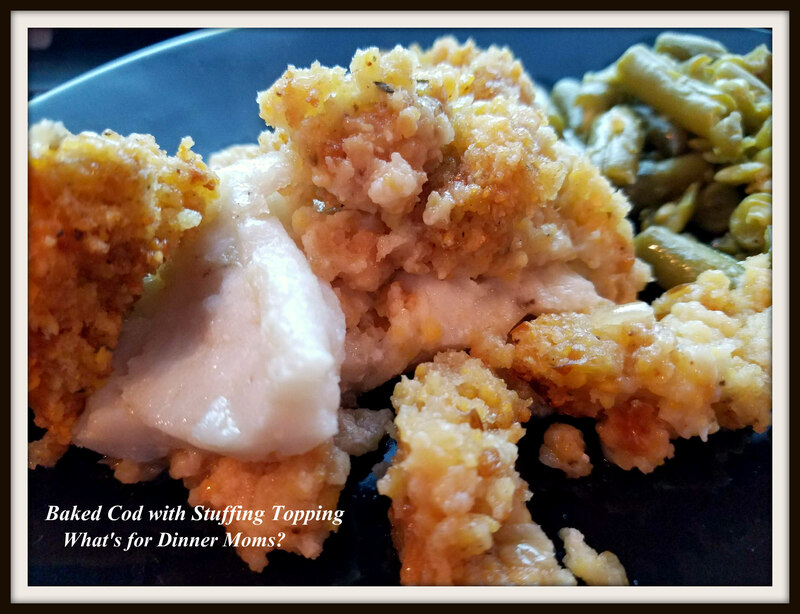 Baked Cod with Stuffing Topping – What's for Dinner Moms? The roller-coaster weather continues. We have had 60+ degree days with lots of fog over the lake (see above), hail with lows of 20 degrees, and some sunshine. But, the snow fences are gone! That means Spring is coming. There were lots of people at the beach yesterday. I love this time of year. Every time we talk about moving the reason I want to stay is the beach and lake. Our dinners are slowly starting to morph into our summer time late evening times. During most of the year we eat about 7:00 pm to 8:00 pm but during the summer it is 9:00 pm to 10:00 pm. With the sun setting later and later each night it is hard to go inside to cook dinner on the occasional warm evening. We live 30 miles from the central time zone so during the summer the sun doesn’t set until 9:30 pm. It is glorious but makes one stay up way too late. This dish was super simple to make and what I am looking for in easy to make spring and summer dishes. It had an element of comfort food in the stuffing but this could easily be made lighter with the addition of more vegetables and less breading. We were not even done with dinner and my daughter asked if we could have more fish each week. I love to hear things like that when we haven’t even finished dinner. I used a corn bread stuffing mix (in the bag – not the red box which I think is too salty) for the topping to cut down on time. I mixed the stuffing mix with chicken stock, butter, onions, and chopped celery (sautéed), This can easily be made by making your own cornbread stuffing to put on top. I served this dish with green beans and a green side salad to complete the meal. Baked Cod with stuffing topping for a comforting meal. Preheat oven to 425 degrees. Spray a 9 x 13 casserole dish with non-stick spray. Lay fish in pan in one layer, not overlapping. Layer stuffing over top of fish fillets. Cover pan with aluminum foil. Bake for 20 minutes. Remove aluminum foil and bake for an additional 5-10 minutes until fish is completely cooked through. Remove pan from oven and serve while hot. We had snow here yesterday and now the big warm up comes. I love fish and hush puppies (haven’t had those in long, long time). Thank you for sharing, Marci! I understand you so well, the sea would definitely keep me from ever moving away! So calming and relaxing just to sit and listen tot the waves. Oh, yes, calming and energizing at the same time. I am always looking for ways to eat more stuffing. I never thought of fish! You rock, I’m trying this soon! I love it! Finding ways to eat more stuffing sounds like my life motto! My family enjoys fish too, Marci. A lovely recipe.